Semiconductor expert Apek Mulay may have been a naughty child. His own mother may or may not agree but Mr. Mulay still appears to be mischievous today. 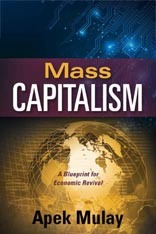 In Mass Capitalism, A Blueprint for Economic Revival, Mr Mulay serves up heavy systematic criticism of capitalism — while promoting “mass capitalism.” Mass capitalism? Everyone knows there is no such thing as mass capitalism. We have private capitalism, state capitalism (as under communism), mixed economy (where private sector sponsors public sector directly and indirectly through such means as employment, taxation, etc. ), corporate capitalism, crony capitalism, to name but a few. But we will never have mass capitalism and for a very good reason: Capitalism is naturally limited to economic exploitation carried out by the few on the many. In fact, everyone cannot perpetrate economic exploitation in the same way as a herd of cows cannot subsist for very long only by drinking the milk of each other. Cows must graze and calves must stop drinking after a while to allow for newcomers — and someone quite different must do the milking and butchering, that is how exploitation of cows goes. Even if one construes a term such as “majority capitalism,” where economic exploitation would be carried out by the many on the few, it would be a misnomer. Such a system cannot sustain, at least not over time, let’s say for more than a few minutes, as there simply would not be enough genuine source material to be exploited by the disproportional (majority) number of exploiters. This is the reason pyramid schemes invariably collapse, and sooner rather than later. So what does Mr. Mulay mean by mass capitalism? Then what is their mass capitalism actually? Mr. Mulay reveals to us that it is nothing but a pseudonym for PROUT, the Progressive Utilization Theory. It is well known that American policy makers and most of the public and the media are wary of the term “socialism” in the same way as a hyperallergic person is wary of fiendish allergen. So while PROUT´s founder Shrii Prabhat Rainjan Sarkar dubbed PROUT “progressive socialism” (while dismissing capitalism to the scrapheap of destructive and useless systems), Mr. Mulay goes along with Dr. Batra´s local market plan. PROUT postulates that no one should be allowed to accumulate physical wealth without the permission or approval of society. This is its first fundamental principle. Its scientific base is that physical wealth is finite whereas human urge is infinite, and therefore accumulation of physical wealth must be limited in the interest of all, while accumulation of mental and spiritual wealth should be unlimited. Becuase of the inherent limitedness of all things physical, capitalism in any form and shape can never sustain. There is no way we can call PROUT capitalism; PROUT is not a system of private capitalism and it is also not state capitalism, it rejects economic centralisation and promotes economic decentralisation. Since the picture of Shrii Sarkar adorns the book´s dedication page, and PROUT is the ideological focus of the Mr. Mulay´s work, it seems only right to emphasise this point. All in all, Mr. Mulay´s work offers a great view from the American standpoint. As is common knowledge, all indications are that the Western economy is in for a very rough ride, in particular because the Western individualised world has sacrificed so much of its social, cultural, and industrial base to external interests, and in the process has outsourced large chunks of its technical skills and knowhow to foreign agencies and lands. Life on other continents on the other hand seems to have retained more of a traditional structure. Therefore it seems probable that a sinking global economy and the eventual collapse of capitalism as we know it would harm the First and Second Worlds infinitely more than the Third. It is therefore not inexplicable that Mr. Mulay and Dr. Batra find it opportune to stimulate a will and sentiment to do something radical about the impossible situation of their (new) country and economic sphere. * Statement in interview with New Zealand National Radio, 5th November 2011, http://proutglobe.org/2012/03/ravi-batra-predictions-and-politics/ (sourced: October 8, 2014). Previous PostWhat Is EconomicsNext PostCorrection – What Correction! It seems that neither Mr. Mulay nor Mr. Overland have done much reading on the general topic of capital formation and distribution. Had they done so, they would have discovered "The Capitalist Manifesto" by Louis Kelso and "Employee Stock Ownership Plans" by Tim Jochim. Kelso used the term "universal capitalism" and both books describe specifical fiscal policies and legislation, both actual and proposed, that would improve capital formation and distribution. For your kind information. ESOP is just one part of MASS CAPITALISM. The bigger things covered in new business models, reforms in tax policies, reforms in financial industry, reforms in way business is done taking into consideration natural macroeconomic cycles of Nature which are beyond control of any nation.